for the minimum bid to make all of his foals eligible for our THREE Stallion Stakes Races. Please do NOT ask what a stallion sold for. We will NEVER share that information. or check your messages area on this website. Be sure to read the terms of the auction below this list before bidding. New feature in this year’s Stallion Auction is DYNAMIC AUCTION ENDINGS. This means if any stallion receives a bid in the last 5 minutes, the auction will be extended by an additional 5 minutes. This will continue until there are no bids received in the final 5 minutes. At that point, bidding is closed for that stallion. This option is in place to give everyone a fair chance to place the last bid and prevent snipe bids at the last second of the auction event. YOU MAY BID IF YOU ARE NOT AN ITBOA MEMBER. IF YOU END UP BEING THE WINNING BIDDER, $75 WILL BE ADDED TO YOUR TOTAL TO COVER 2019 ITBOA MEMBERSHIP. Please click HERE to read Thoroughlybred Online Buyers Guide before bidding. LIVE NURSING = A one year Breed Back to the same mare if she does not conceive, aborts the fetus, or does not produce a live foal which stands and nurses in 2020. Applicable only if the stallion is standing at the same farm in 2020. Not all stallions are Live Nursing. Check the "At a Glance" section on each stallion page next to the heading GUARANTEE: to determine what each stallion is selling as. All buyers MUST be an ITBOA Member. If you are not, add $75 to your total. FEES: 5% fee if paying with Credit Card. Payment must be received within ten days. 1. The Stallion owner nominates his/her Stallion for the ITBOA Stallion Stakes of 2022 and 2023 by donating a stallion service to the 2018 ITBOA Stallion Auction. Said Stallion service shall be auctioned by the ITBOA and upon successful sale of the Stallion service, all foals conceived in 2019 and foaled in 2020 are automatically eligible to nominate to the ITBOA Stallion Stakes of 2022 and 2023. Each race will have a purse up to $70,000. Iowa Breds will be eligible for extra supplement if running 1st - 4th in these open races. 2. Proceeds from the 2018 ITBOA Stallion Auction will provide funding for the purses offered with the ITBOA Stallion Stakes of 2022 and 2023. 3. For foals of 2020 to remain eligible for the ITBOA Stallion Stakes in the year 2022 and 2023, all nomination requirements must be fulfilled on or before the due date. 4. Minimum bid is $500.00 (Five Hundred) or the reserve established by the Stallion Owner whichever is greater. Payments for seasons are due during or immediately after the auction. Make all checks payable to ITBOA. 5. ITOBA acts as agent only and will endeavor to protect the interest of both buyer and stallion owner. It is the buyers responsibility to contact the farm to understand any fees which may or may not be listed in this auction. 6. Should the stallion die or become unfit for breeding purposes before the mare has been serviced, contact the ITBOA immediately. 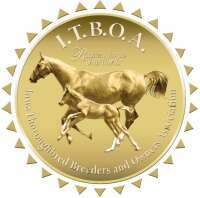 The ITBOA board will handle each issue on an individual case bases and will always verify the stallion is deceased or has become unfit for breeding purposes. You MUST notify the ITBOA by July 15th of that breeding year. No cases will be considered after that. 7. Stallion owner is not responsible for any disease, accident, sickness and or death of a mare or foal and similarly mare owner will not be responsible for any disease, accident, sickness and or death of the stallion. 8. Mare, in order to qualify for breeding must be halter broke and have a current negative Coggins and or uterine culture as required by stallion owner. 9. A stallion service certificate will be provided to mare owner from stallion owner upon payment in full of all board, veterinarian, or other services upon the birth of a live foal. It is the mare owners responsibility to contact the stallion owner to receive the stallion service certificate. 10. Membership in good standing with ITBOA is required to purchase a stallion season. 11.Sale of the dam before foaling or sale of foal after nomination has been completed will not affect the eligibility of the foal. The new owner will be responsible for any remaining nomination fees due in order for the foal to remain eligible. 12. There will be no substitutions for an entry. 13. Stallion owners have the option to buy their stallion back at the minimum bid, if he does not sell, to make all his foals eligible. A $5000 Bonus will be awarded to the person who purchased the stallion season and the resulting foal conceived from the actual season sold at the 2018 ITBOA Stallion Auction if that foal wins the ITBOA Stallion Stakes as a two-year-old and/or a three-year old. In order to be eligible for the $5000 Bonus the purchaser of a season sold at the 2018 ITBOA Stallion Auction must nominate the mare bred to the stallion of that season by December 1, 2019. I will send a Mare Declaration form for you to fill out and return in the Fall of 2019. The owner of the foal conceived must complete the nomination payments on or before the due date(s). Change of ownership does not affect a foal’s eligibility for the bonus. The Iowa Thoroughbred Breeders and Owners Association (ITBOA) is a non-profit organization responsible for promoting the breeding and racing of Thoroughbreds in Iowa. The ITBOA currently represents nearly 500 Iowa-bred owners and breeders.